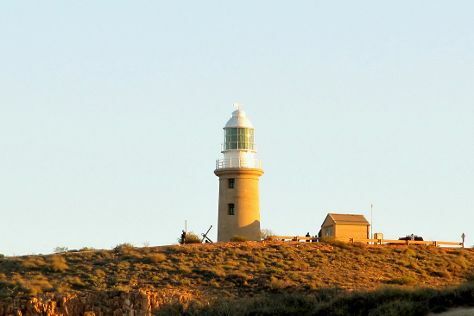 Exmouth is a town on the tip of the North West Cape in Western Australia. The town is located 1270km north of the state capital Perth and 3366km southwest of Darwin.The town was established in 1967 to support the nearby United States Naval Communication Station Harold E. Holt. Beginning in the late 1970s, the town began hosting U.S. Air Force personnel assigned to Learmonth Solar Observatory, a defence science facility jointly operated with Australia's Ionospheric Prediction Service.HistoryThe location was first used as a military base in World War II. US Admiral James F. Calvert in his memoir, Silent Running: My Years on a World War II Attack Submarine, and US Vice Admiral Charles A. Lockwood in Sink 'Em All, his narrative of Allied submarine warfare, describe its history. After the retreat from Java in March 1942, Allied naval forces had need of a forward base for replenishing submarines, then the sole form of offensive warfare against the Japanese. Both Darwin, Northern Territory, and Broome, Western Australia, were too exposed to air attack, so a 500-ton unmotorized lighter was placed as a refueling barge near the mouth of Exmouth Gulf, where the Allies were already maintaining a seaplane tender. Exmouth is in Western Australia. Use our Australia tour itinerary maker tool to arrange your visit to Exmouth and other destinations in Australia.